The first time that Mohamad Masoo dreamed of being an Olympian he was still living in his hometown of Aleppo, Syria. A city now torn apart by war, and a city he decided to leave only a year and a half ago. Now Masso, a member of Team ITU, literally lives another life in Hannover, training hard with just one goal in mind, Tokyo 2020 Olympics. A swimmer since he was six years old, he started triathlon in Syria when he was 17, even though training in his hometown was not always safe. “Last time I was training in Damascus, at the Tishreen Stadium, a bomb exploded inside the stadium. People had told me to stop going there for training, they said that it was too dangerous, but I didn’t care… until that day”, he explains. Luckily, all of them made it to Greece safely, and from there, as thousands of other refugees from Syria, crossed thousands of kilometres and several countries until he settled in Germany, and is now training hard in Hamburg. 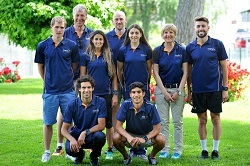 At the beginning of the year, he was appointed to Team ITU, which aims to provide support, resources and expertise to athletes from emerging or developing National Federations with the opportunity to compete at the Olympics and at a World Cup level in the meantime. “I really think I can make it to Tokyo 2020, I really want to be Olympian, representing my country, Syria, or as a member of the IOC Refugees Team”, explained Masoo before racing in the ITU Madrid World Cup. “I am really working hard to get there”. **With the sharing of this incredible story, ITU is excited to launch a public campaign called #TogetherWeTri! We want to share more articles and stories like this and show how triathlon is a sport where people can come together in all types of circumstances. Have you witnessed someone lending their equipment at a race? Or are a part of a life-changing training group? Or simply have a story of someone who has inspired you in the sport? Then we want you to share it with us! Send us your stories online using the hashtag #TogetherWeTri and we could feature you on our website and social channels!